The General Assembly of the Matsés Movement (formerly the Movement in the Amazon for Tribal Subsistence and Economic Sustainability - M.A.T.S.E.S.) has elected a new Board of Directors in a meeting held in Iquitos, Peru in the Amazon River Basin. The chief of the Matsés Native Community was present at the meeting in which the Matsés teachers elected a 100% indigenous leadership for this non-profit association. The Peruvian government's Peru Petro has awarded Pacific Stratus Energy oil concessions within the lands that the Matsés tribe holds legal title to. The contract gives the Canadian oil company the ability to explore for petroleum on the Matsés titled lands and start drilling oil wells. The adverse effects of drilling for oil on the Matsés lands could put the survival of the Matsés culture in jeopardy. 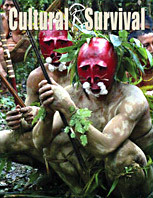 The Matsés Movement has been featured in the cover article for Cultural Survival Quarterly Magazine. This special issue is about Land & Resources in the Americas and features the Matsés Movement in the article, A Forest of Their Own. Our association, the Matsés Movement, is launching a new project to assist indigenous schools obtain basic school supplies such as notebooks and writing materials for both students and teachers. To learn more about this new program, please see Adopt an Indigenous School. The primary mission of our non-profit association is to offer assistance to the Matsés indigenous communities so that this native Amazonian tribe can conserve their native culture and indigenous lands in a sustainable and autonomous manner. Please note that the Matsés Movement does not solicit nor accept donations from the public. Small donations do little to help and can create internal conflicts. The Matsés Movement is distinctive in that it is the first non-profit association whose directors are entirely from the Matsés tribe itself rather than being controlled by outsiders. In the past, various NGOs composed entirely of non-natives acted as self-appointed representatives for the Matsés tribe with few benefits to the Matsés people. It is our belief that with education and experience, the Matsés nation is capable of determining its own future, independent of the wishes and interests of outsiders. The Matsés Movement is an association whose members are entirely composed of individuals from the Matsés tribe offering assistance to the Matsés people. The origins of the Matsés Movement can be traced to a grass-roots movement by the Matsés people which originally established this nonprofit association in 2006 as the Movement in the Amazon for Tribal Subsistence and Economic Sustainability - M.A.T.S.E.S. To understand how the Matsés Movement came about in the first place, you need to understand the present situation of the Matsés tribe. There are fourteen different communities within the Matsés Native Community in the Amazon Rainforest and living conditions are much the same as they were before the Matsés tribe made permanent contact with the outside world in 1969. There are few phones, no public transportation, and almost no governmental projects of any kind there. Little medical or other aid is being provided by the Peruvian government. Incredibly, there are hardly any health care professionals present in the entire indigenous reserve. The only thing that could be remotely interpreted as significant governmental aid is the presence of teachers whose salaries are paid by the Peruvian Ministry of Education. There is little travel by the Matsés outside the reserve. However each year during the school summer vacation, the teachers are brought to Iquitos by the Ministry of Education where they take classes on bilingual education. It is from the teachers that our organization was formed. The Matsés Movement is truly a grass-roots organization in that the Matsés people themselves formed this organization through the participation of their teachers. The Matsés Movement is a non-profit association situated in the Peruvian Amazon working for the future of the Matsés and other indigenous people and is independent of the Matsés Native Community. For more information on indigenous Amazonians, please visit Amazon-Indians.org, Amazon-Tribes.com, Amazonz.info, Matses.info, and Friendsoftheamazon.org. For information on the indigenous people of the Andes Mountains, please visit Incatrails.org and Camino-Inca.info. 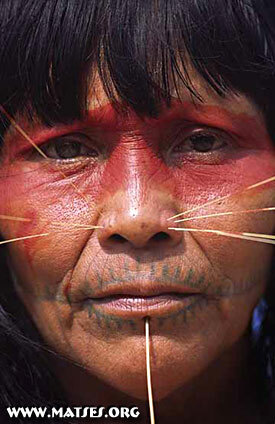 To learn about Iquitos, Peru where the Matsés Movement is located, please visit the Iquitos News. © Copyright 2006-2018, Matsés Movement, all rights reserved.